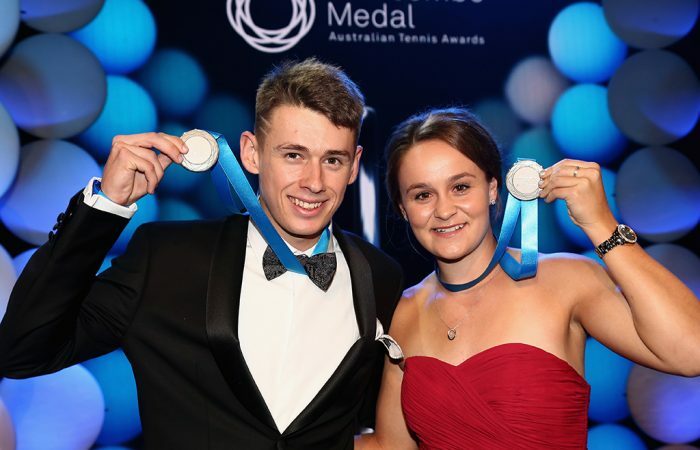 Highlighting an incredible year for Australian tennis, Ashleigh Barty and Alex de Minaur were on Monday night presented with the Newcombe Medal - the first time the medal has been jointly awarded. Ashleigh Barty (Qld) and Alex de Minaur (NSW) have been announced as joint winners of the prestigious Newcombe Medal for 2018 at the Australian Tennis Awards at Crown Palladium tonight. 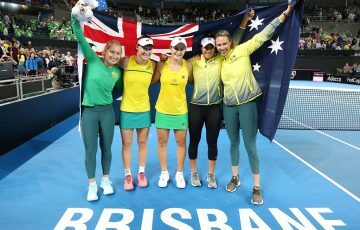 In what has been a stellar year for Australian tennis, Barty took out her second consecutive Newcombe Medal while De Minaur made the leap from Junior Athlete of the Year in 2016 and 2017 to win his first Newcombe Medal in front of the who’s who of Australian tennis. Barty and De Minaur were awarded Australian tennis’ highest honour by legend John Newcombe at the annual awards ceremony, edging out fellow nominees Dylan Alcott (Vic) and John Millman (Qld). 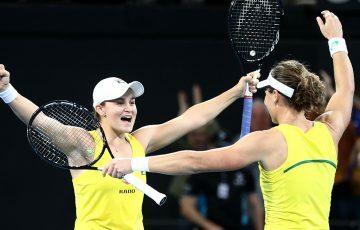 Newcombe said that from four exceptional nominees, the selection decision came down to one between Barty and De Minaur. For Barty, another outstanding year on the international circuit saw her achieve career high rankings in both singles and doubles. The 22-year-old is currently one of only two women ranked inside the world’s top 20 in both disciplines. 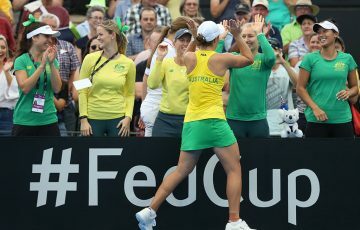 Barty won her first Grand Slam at the US Open in doubles and finished the year on a high, winning the WTA Elite Trophy Final in singles in Zhuhai. “It’s been another phenomenal year, in particular led by Tyz (Craig Tyzzer), my coach,” Barty said. “He’s the most phenomenal person. And he’s not only improved my game on the court but he’s helped me become a better person. And I really wouldn’t be able be do that without his support. “We’ve had some amazing additions to my team this year, and every single person sitting at my table has influenced me in different ways throughout my life and career. “It truly is amazing to be standing up here again. I’m very grateful and very thankful to be in the position to be able to play the sport that I love, to do this as a job and to enjoy every single moment. “Alex has had one of the most incredible years I’ve ever seen. He thoroughly deserves the award as well. 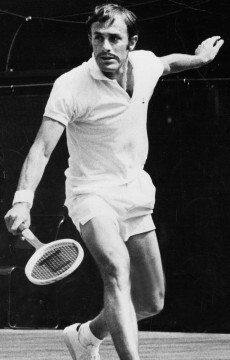 What he’s been able to achieve this year has put tennis in a very good place on the men’s side. 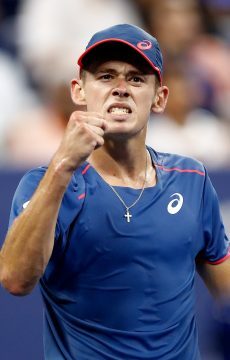 De Minaur, 19, enjoyed a breakout season, pushing his ranking from outside the top 200 to world No.31 and reaching the third round of both Wimbledon and the US Open. He capped off his year as finalist at the Next Gen ATP Finals in Milan and was named ATP Newcomer of the Year. “This is something I definitely did not expect,” he said. “It’s been a whirlwind of a year – I’ve enjoyed every second of it. I’ve just tried to keep improving each day, keep battling it out, keep fighting every single point. I’m super proud of my efforts. “I could not have done it without the great team of guys I’ve got around me. Starting with my coach Adolfo Gutierrez, who’s not here right now. My manager David Drysdale, Phil Bonney, and also got to thank Lleyton Hewitt, who’s been a great mentor of mine and has helped me out a lot, helped me really believe in myself and that I do belong here on the tour. The Newcombe Medal is the premier award presented on a night that recognises players, coaches, clubs, communities, volunteers and officials for their service to the sport. The awards ceremony has been held annually since 2010.